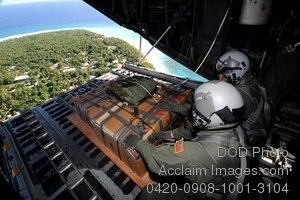 Description: Free, public domain image: Servicemen Waiting to Drop Donated Supplies from a Plane. Tech. Sgt. Heath Bahyi and another crewmember wait for the right moment to push a boxed pallet of donated supplies from a C-130 Hercules during the 2008 Operation Christmas Drop Dec. 19 over the remote Island of Yap. Through military and local community support, the operation collected tens of thousands of donated items and raised more than $30,000 in support. Airmen today continue the tradition of delivering supplies to remote islands of the Commonwealth of the Northern Marianas Islands, Yap, Palau, Chuuk and Pohnpei. Sergeant Bahyi is a loadmaster from the 36th Airlift Squadron from Yokota Air Base, Japan. (U.S. Air Force photo/Master Sgt. Kevin J. Gruenwald.